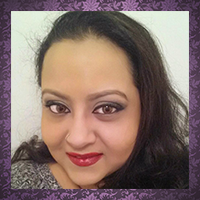 Hi there, my darlings!! 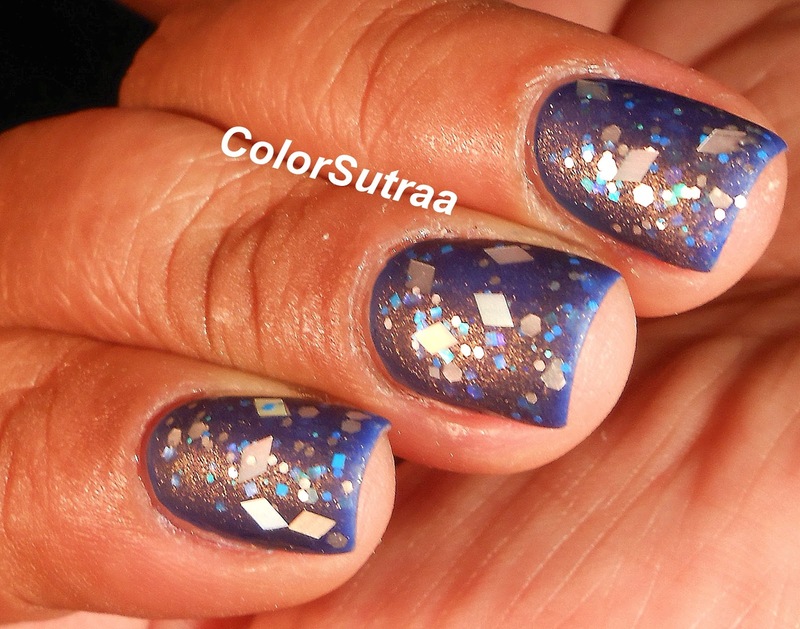 As promised, I have the second part of Daphine Polish's Holiday 2013 collection for you--the previous post HERE showed you the holographic/shimmers and this post is devoted to the 5 glitter topcoats that make up this collection! 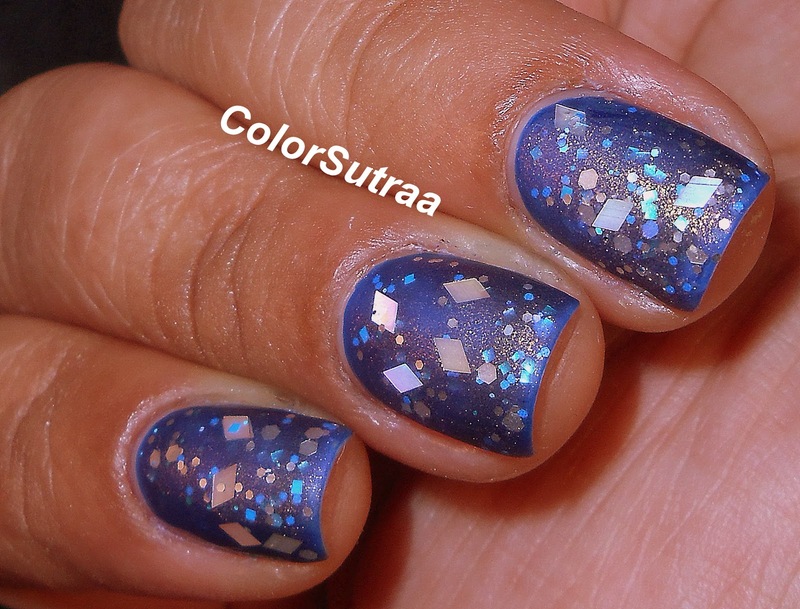 Next, I have for you Frosty--a clear topcoat chock-full of white and iridescent glitters, including teeny tiny iridescent microslices. 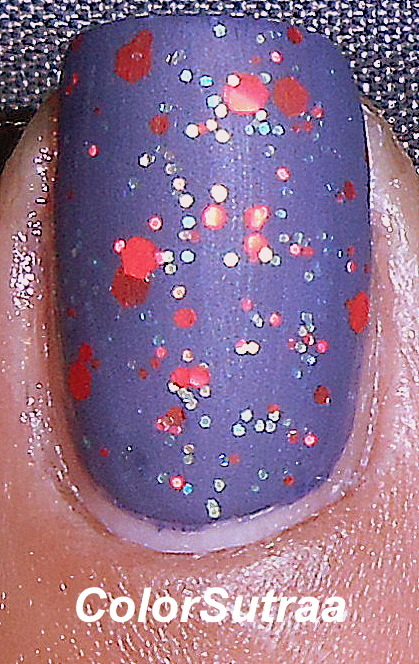 The swatches below show two smooth coats over 2 coats of OPI We'll Always Have Paris, topped with 1 coat of G&G's HK Girl . 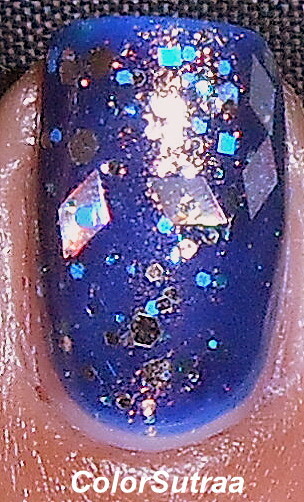 Now I'm not usually a big fan of bars, but these microslices are pretty unobtrusive and I LOVE the iridescence of them! Look at that blue flash! 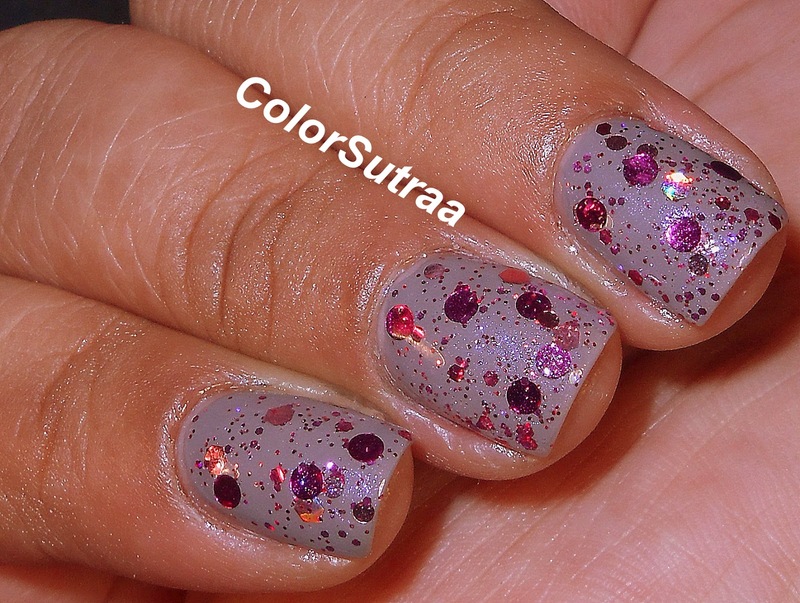 Next, I have my personal favorite of the bunch, Rosina Violet--a clear glitter topcoat with bright pink glitters, including bright pink holographic circles, with added pink shimmer. 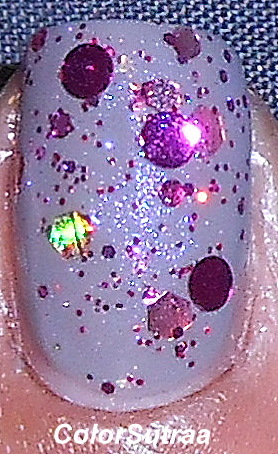 The swatches below show 2 easy coats over two coats of China Glaze Recycle, topped with 1 coat of G&G's HK Girl. 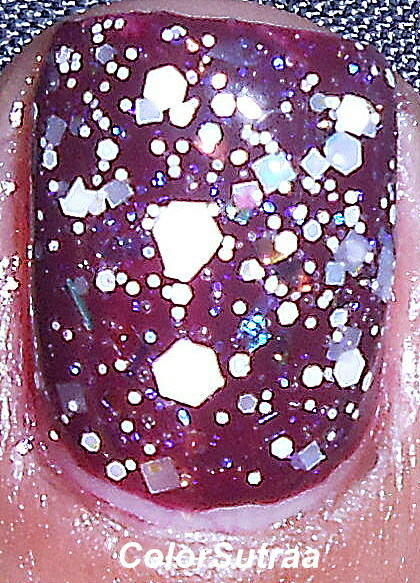 I love, love, LOVE circle glitter and this one does NOT disappoint! SO pretty! 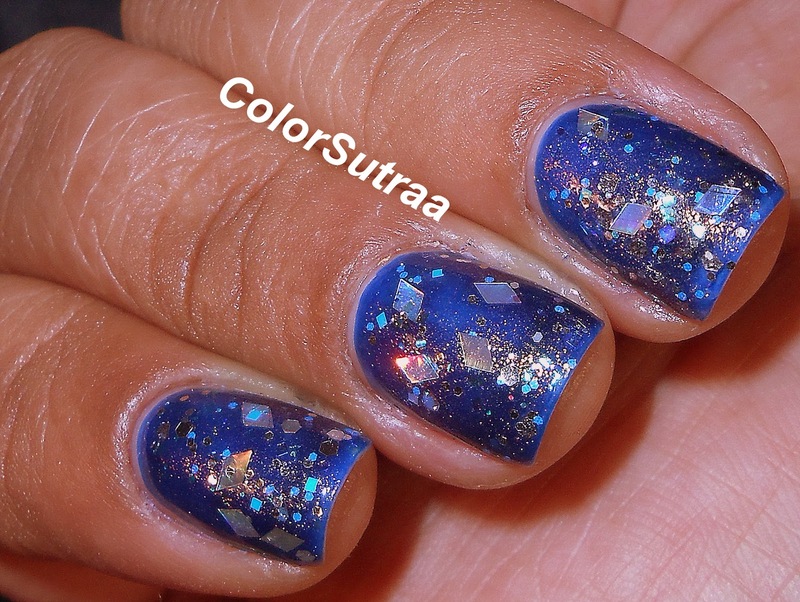 Matte with and without flash! 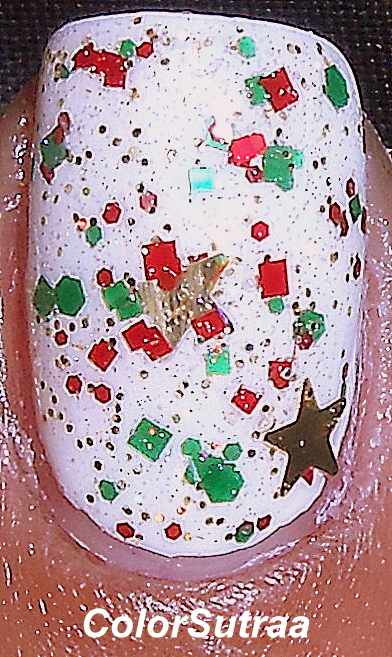 Up next, I have for you Rudolph's Nose--a gorgeous clear topcoat with maate, metallic and holo red glitters and green microglitter. 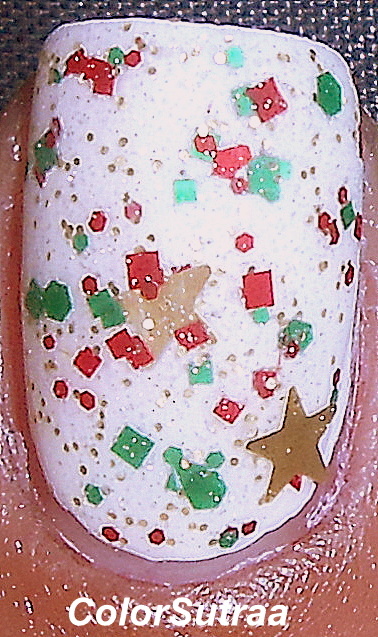 The swatches below show 1 coat of Rudolph's Nose on the index and ring fingers and 2 coats of Rudolh's Nose on the middle finger, all over 2 coats of Zoya Sailor. 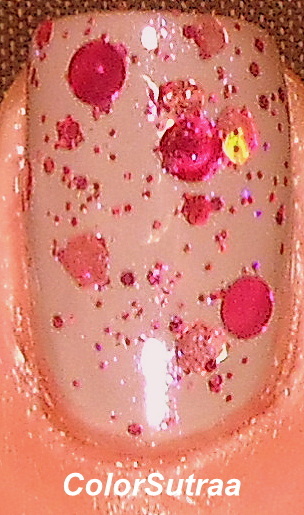 I absolutely love how this combination turned out--Zoya Sailor is the perfect undies for the bright red glitters! 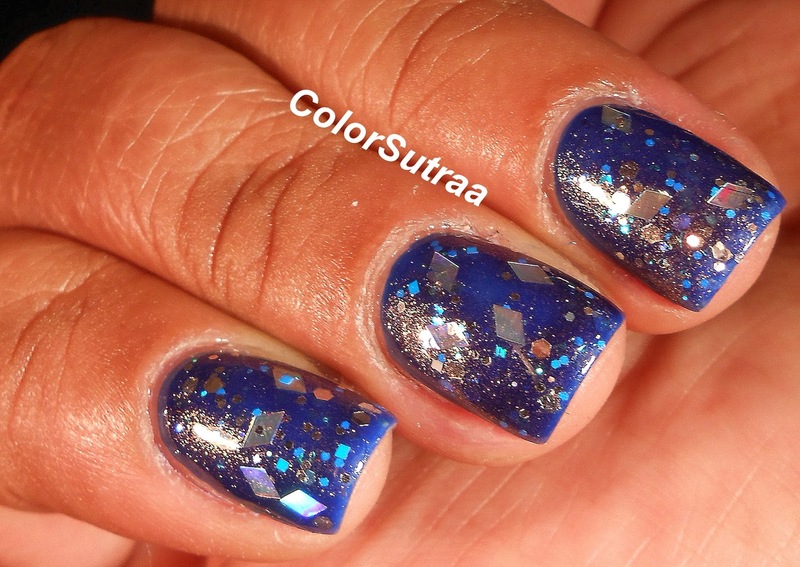 Last but definitely not the least, we have Skatin--a clear glitter topcoat with blue and silver metallic glitter, tiny matte blue glitters and large holographic diamonds, along with tons of gold shimmer. The swatches below show show 2 generous coats over two coats of Revlon Royale, topped with 1 coat of G&G's HK Girl to finish the look. Seriously...those diamonds!!! OMG! 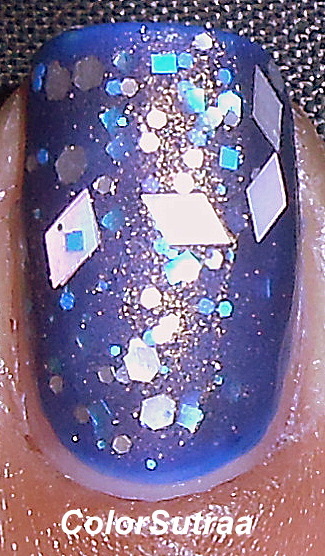 So there you have it!The glitter half of Daphine Polish's Holiday collection, which you can find at Daphine Polish's Etsy shop HERE, for $10 a full-size, 0.5 oz bottle. And remember! From today, November 29th, 2013 to Monday, December 2nd, 2013, EVERYTHING is 20% off on her site!! PLUS, every order over $30 will receive a Limited Edition polish free! YAY!! Hurry!! Which one did you like the best? Tell me your favorite in the comments section below! These are all great....Christmas in a bottle is right! !